This week's image of the week looks at Supernova remnant W44 and its environment (November 2012). 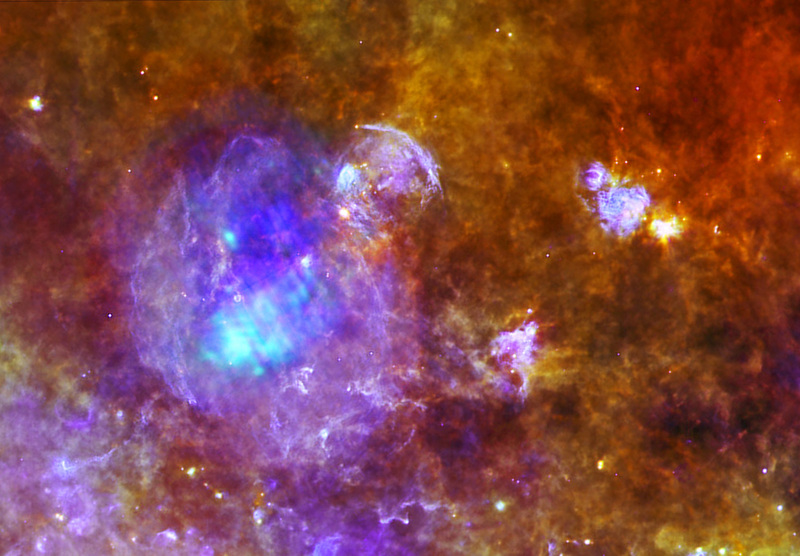 The large purple area on the left of the image is supernova remnant W44, measuring at about 100 light-years across. Data from the European Space Agency’s XXM-Newton suggests that the remnant is filled with X-ray emissions from hot gas. The light blue and dark blue represent high and low X-ray emission. The image was created by combined data from the largest ever infrared space observatory, Herschel and the XMM-Newton space observatory. Herschel’s PACS 70, 160 micron and SPIRE 250 instruments were used to create the three-colour infrared view. A key component of the satellite was led by the UK. The SPIRE (Spectral and Photometric Imaging Receiver) instrument which was used in the image, was developed by an international consortium. It is led by a Principal Investigator from Cardiff University. The assembly and testing of SPIRE took place at the STFC Rutherford Appleton Laboratory (RAL) in Oxfordshire. The instrument was delivered for installation in the Herschel satellite in April 2007. Other UK institutes involved in SPIRE are Imperial College London, University College London’s Mullard Space Science Laboratory and the UK Astronomy Technology Centre, Edinburgh. The UK SPIRE team has lead responsibility for instrument operations. UK companies involved in the mission include AEA Technology, Analyticon, BOC Edwards, Datasat, MT Satellite Products and System International. To find out more information about UK involvement in Herschel, read our case study. Remember to follow us on Twitter, like us on Facebook and follow our new Instagram account! From urine samples to space conferences: it's been a busy couple of weeks! Could you lead Europe’s space ambitions?